Buying gold: I arrive at the offices of Gold Investments, tucked away next to the New Moon pub in London’s Leadenhall market. I am meeting senior bullion dealer, Oliver Temple, to discuss investing in gold for the first time. Gold Investments’ location is convenient as I work in the City although I discovered them online first. I was impressed by their informative website. I am particularly interested in buying gold coins and I would like to find out more. I am, if you like, wanting to ‘dip my toe in the water’ with investing in gold. With gold coins, in particular, I feel that they could become a nice heirloom to pass onto future generations as well as being potentially good investments. Oliver welcomes me to the office and I immediately like his friendly approach. He also comes across as extremely knowledgable, as do the rest of the team. Gold Investments has been trading since 1981 and is one of the oldest bullion dealers in the UK. It is still family-run. I explain that I am looking at buying gold coins. I must admit I have never held a gold coin so it was nice to actually see one which Oliver produces – a Sovereign. It weighs around eight grams he tells me. We talk about how gold has performed recently – it rose last year after Brexit before settling down again. It climbed again after Trump won the US presidential race and then dropped back. Oliver says it is best to view investing in gold as a medium to long-term investment strategy. Gold Investments sell a range of gold coins and bars. Oliver says that there is a myth that you have to be rich to buy gold. Even with my modest budget, a Sovereign is affordable. Oliver tells me that Gold Investments has secure bullion vaults at the London Silver Vaults, not far away in Chancery Lane. Storage rates are some of the lowest on the market, Oliver tells me. One of the issues, Oliver explains, is that some bullion dealers mislead customers with ‘headline’ prices. On one established dealer’s website, Oliver says they are seeing the price of a Krugerrand appearing to be low (because of a special offer) but in actual fact the coin is more expensive than from a reputable dealer such as Gold Investments. This is another thing that strikes me with Gold Investments, you can trust them. They must be doing something right after all these years of trading. Oliver says they still have many of their original customers. I was not aware that the coin, like Britannia and Sovereign coins, are exempt from Capital Gains Tax. There is also no VAT on gold. The Sovereign I am holding is almost like a miniature work of art or sculpture. Oliver says that gold prices may increase more in 2017 – investors tend to turn to gold in times of economic uncertainty. Oliver explains that with the Brexit Article 50 being triggered and Trump being sworn in as US president this year, no one knows actually how the markets will react or the overall impact on the global economy. I decide to purchase two Sovereigns which I intend to give to my children later in life. 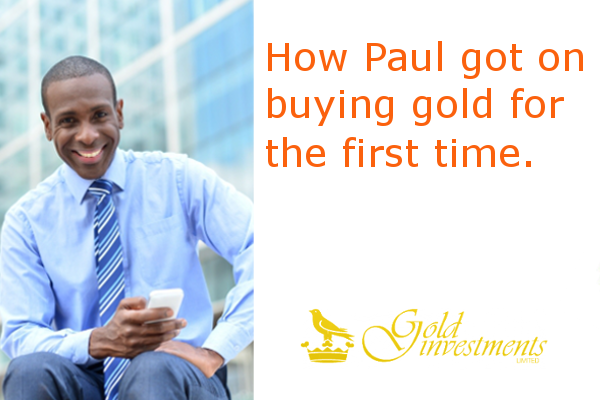 Using Gold Investments own website –www.goldinvestments.co.uk – I am pleased to see that my payment is taken quickly and securely through World Pay. I am sure this will be only the start of investing in gold for me on a regular basis and from Gold Investments who I would highly recommend. I cannot wait to see my two daughters’ faces on one of their big birthdays when I present them each with a coin. View Gold Investments’ gold coins here. Main image – stockimages (freephotoimages.net). Image of office from Google. Case study for illustration purposes only.